A rummage sale was hosted by the First Congregational Church in Berkeley to raise money for the house of worship's repairs (Nov. 12, 2016). 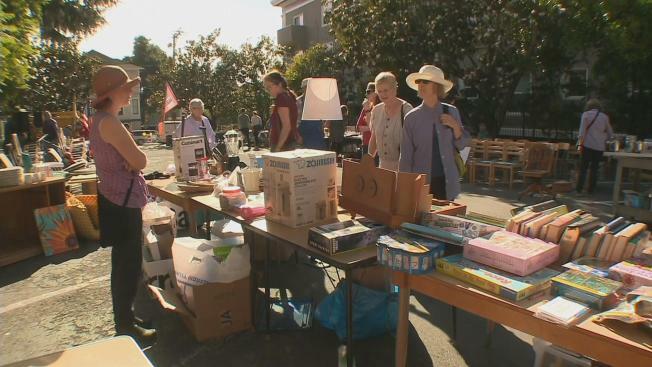 Parishioners at the First Congregational Church in Berkeley, a badly damaged East Bay house of worship that caught fire in September, hosted a rummage sale Saturday to help gather funds in order to foot the bill for repairs. Utilizing donated keepsakes and relics from the church's popular thrift shop, volunteers turned out and helped put a dent in the brick buildings damages, which is estimated at $2 million. Rev. Molly Baskett said that the church's sanctuary could open up within the next two to three months, but fixing the entire campus could take years. "It's a work of work to rebuild," she said. Members of the First Congregational Church are currently worshipping at Congregation Beth El, a nearby synagogue.